According Bon was the Buddha Tonpa Shenrab Miwoche already enlightened before he came to earth. Tonpa Shenrab was said to have already been enlightened in his celestial pre-existence as Chimed Tsugphud ('Chi-med gtsugphud). In this guise, on a higher plane of existence, he transmitted the teachings of Dzogchen and Tantra to a prince from Tazik named Sangwa Dupa (gSang-ba 'dus-pa, Skt. Guhyasamaja), who returned with them to earth. Thereafter he propagated the teachings and subdued many gods and demons for the benefit of humanity. It is said that in a future incarnation this prince became the Buddha Shakyamuni. According to Bonpo Lamas, this would account for the similarities in teaching and practice between Indian Buddhism and Bon. They both have the same ultimate source. By the way Bon does recognise the future Buddha Maitreya. Last edited by kalden yungdrung on Wed Jun 29, 2011 11:25 pm, edited 2 times in total. So how come he left his wife and kids? I guess to show others something ? What would he show them with that, leaving his kid and wife and the rest of his family? Like every Buddha, does He show the people /human beings etc. the paths to enlightenment. so now you taught caveman what he needed to know. What did Caveman need to know? Sorry i cannot follow your statement regarding Caveman and i do not know Caveman or you in that sense, so that i must know your needs. So i cannot know what he does need to know, well i guess you must know it. Composed by: Dranpa Namkha 914 B.C. You bring about the liberation of all beings from samsara with your great love. I pay homage to Shenrab, the Nirmanakaya! He was so kind to give me this text. Buddha Tönpa Shenrab the founder of Bön manifested in this worldly realm in order to teach Bön Dharma. Tönpa Sherab emanates as a concrete embodiment (སྤྲུལ་སྐུ་) of the Kuntu Zangpo. Tönpa Shenrab while preaching is represented in three forms: in kings attire, wearing the thirteen peaceful ornaments, and in monks robes. The teachings of Bon were taught at three different times called the three wheels of Bon (བཀའ་འཁོར་གསུམ་) representing the 3 times in which he taught. These teachings are said to be of 3 kinds. - Finally the core or essential explanations (མན་ངག་ mengag) correspond to the Outer, Inner and Secret teachings and those of the Great Perfection (rdzogs chen). The 3 representations of Tönpa Shenrab correspond respectively to his appearing as a king, in the thirteen ornaments and as monk respectively. (སྟོན་པ་རྒྱལ་ཆས་ཅན།) As a king in royal attire. It is said that Tonpa Shenrab was born as a king but later renounced to become a monk. As a king he took care of the basic needs of his subjects and in his first teachings he taught the Nine Ways emphasising the Four First Ways which deal with the knowledge of the wordly and spiritual matters necessary for everyday life: Medicine, Astrology, Ritual, Divination (important in traditional Tibetan culture for the worldly and spiritual needs of common people). This also refers to རྒྱུད་ the teachings in their extended version (said to be like the totality of the stars in the sky (རྒྱུད་ཀུན་ཕུན་སུམ་ཚོགས་པ་ནི། མཁའ་ལ་རྒྱན་ཚོགས་བཀྲམ་ལྟར་བཤད) because in the 9 Ways of Bön the whole of the Bön teachings are included. སྟོན་པ་ལོངས་སྤྱོད་རྫོགས་སྐུ། adorned with the 13 peaceful ornaments (ཞི་རྒྱན་བཅུ་གསུམ་གྱིས་བརྒྱན་པ་, zhi rgyan bcu gsum gyis brgyad pa). སྟོན་པ་ལོངས་སྤྱོད་རྫོགས་སྐུ།']Tönpa Shenrab is represented here in his body of enjoyment (rdzogs sku) wearing the thirteen ornaments such as a crown, earrings, necklaces, bracelets, throne and the five silken garments. The 13 peaceful ornaments are symbols of that perfection and a sign that he has traversed all the 13 stages to Buddhahood (sa bcu gsum). 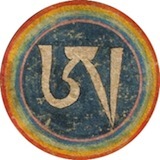 This corresponds to the Teachings of the 4 Doors and the Treasury and refer to (ལུང་རྣམས་ལྟ་སྤྱོད་བྱེ་བྲག་ནི། གཟའ་སྐར་འཁོར་ལོ་ལྟ་བུར་བཤད་), the mid-size teachings which are wisdom and means and said to be like the sun, moon, planets and constellation. The middle-size version of the teachings emphasize the Tantras and the 10 Perfections (paramita, Tib ཕར་རོལ་དུ་ཕྱིན་པ་). (སྟོན་པ་ཁྲི་གཙུགས་རྒྱལ་བ།) Tönpa Shenrab in monk robes represents the higher teachings of Dzogchen. These refer to the concise explanations which are called man ngag as (མན་ངག་ཐུགས་རྗེ་དོན་གསལ་བ། མཁའ་ལ་ཉི་ཟེར་འདུས་ལྟར་བཤད་) and it is said to be like the concentrated rays of the sun in the sky. During the third turning of the wheel of Bön, Tönpa Shenrab is said to have emphasized the teachings of Great Perfection. It is said that Tönpa Shenrab as a king tried to overcome chapha Lagring, the King of the dü demons (བདུད་ཁྱབ་པ་ལག་རིང་) but did not succeed and neither he could succeed later wearing the 13 peaceful ornaments. Finally when he renounced the world and became a monk he could win over Chapha Lagring who asked for his teachings which were those of Dzogchen.